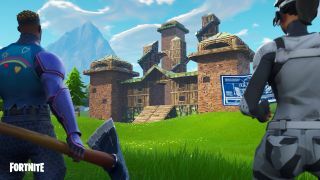 Fortnite’s latest patch has broken free from Epic’s servers like an Arctic ice-shelf in summertime, bringing multiple new features for both Fortnite’s Battle Royale and Save the World modes. Foremost amongst version 6.01’s updates is the “Chiller” weapon, a common trap new to Battle Royale that will freeze the feet of anyone who it’s directed toward. This can be used to wrong-foot an a opponent, or on an ally or even yourself to quickly slide away from an enemy for a cool escape. The trap can be placed on floors, walls, or ceilings, and drops in stacks of 3 in treasure chests, supply drops, supply llamas, etc. In addition, Fortnite 6.01 adds more options to your custom playground, letting you alter settings such as starting health, time of day, and even gravity. The patch also swats a number of bugs, such as hiding pets alongside your own avatar if you zoom the camera too close, and increasing the hitbox size on the Fancy Tomato. Video. Games. Save the World isn’t left holding out for a hero either. Two new weapons have been added to the weekly store. First up the Lead Sled Hammer, which is a fast-swinging hammer that gains speed with each hit, and enables the wielder to perform a powerful “Leap Attack” that propels you to the targeted enemy for a nasty strike that also knocks them down. Second is the Obliterator Sniper Rifle, a high-calibre rifle that deals heavy-base damage at the expense of a slow firing rate and a kick like a mule that’s just eaten a scotch bonnet. The Obliterator can fire through walls and even tear a hole straight through husks, so you can have fun trying to line-up shots that will kill multiple enemies at once. Below is a (rubbish) video showing off the chiller in action. Although you can read the full patch-notes for Version 6.01 here. Update: The post originally referred to this patch as version 6.1. It is actually v6.01.